Pittsburgh Fan With Sign Sculpted Into His Body Hair Invades D.C. This just in to Yinzerspin. 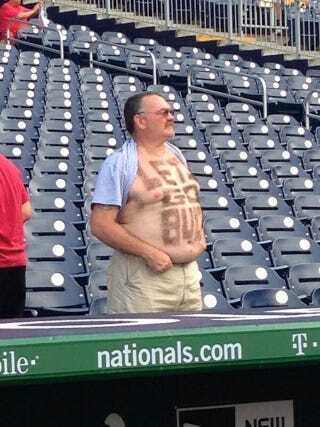 Mark Zuckerman of CSN Washington spotted this guy a few minutes ago at Nationals Park, where the Pirates are getting set to play the Nats in about 30 minutes. Is this the same jagoff who shaved something similar into his body hair at a Penguins playoff game a few months back? Someone else can answer that question. I really don't feel like making the comparison by studying the evidence.